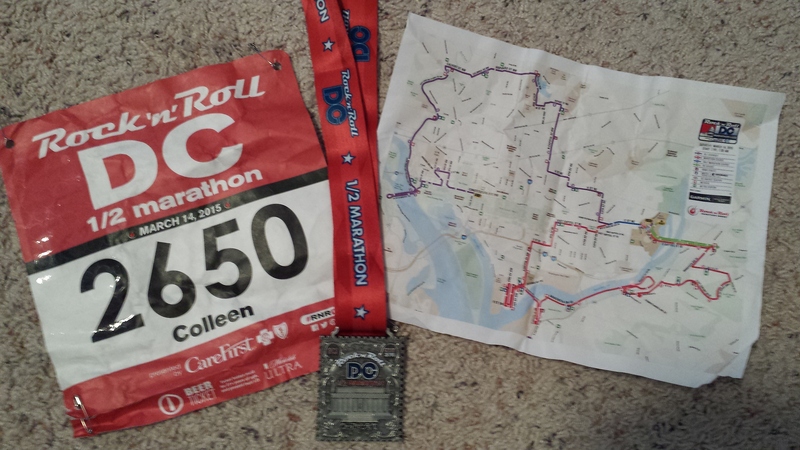 On Saturday I ran the DC Rock ‘n’ Roll Half Marathon. I finished in a time of 1:51:58 and while not a PR, I was really pleased with my performance for the race. 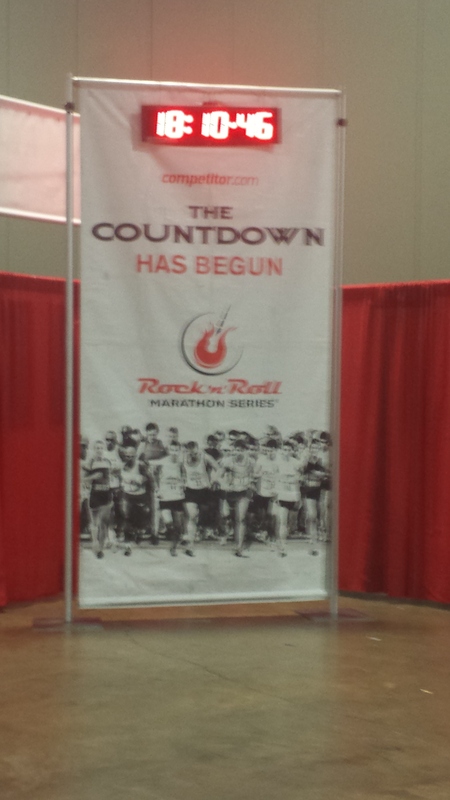 I should start this recap by saying that I’m not a big fan of the RNR races in general. I think they are too expensive, poorly organized and promise things they don’t deliver based on past experience, so some of my critiques might be based on already having a negative view of them. I got a great discount for this one though, so I decided to give them another shot. I stopped by the expo on Friday at the DC Convention Center during my lunch break and was pleasantly surprised by how quickly I was able to grab my bib, shirt and make my way through the expo. I made a quick stop at the honey stinger booth to grab a few waffles and bites! On Saturday morning I was up at 5am. I had a couple pieces of toast and a yogurt for breakfast and did some of my core routine. It was supposed to be high 40s and rainy. I could already hear the rain on the windows so I knew we weren’t likely to get any reprieve from that and we sure didn’t. I wore my Oiselle flyte long sleeve over my gwen tank with stride shorts and CEP tall compression socks along with my speedy Newton shoes. I drove to Rosslyn and took the metro in from there. I figured getting to the Federal Triangle stop an hour before the race start would give me plenty of time. I would be wrong. I really regret not getting off at the Smithsonian stop instead. It took probably 25+ minutes just to get out of the metro station. The rain was coming down pretty good and in typical RNR fashion everything at the start seemed disorganized and a pain to get to. I ran my way past the race corrals and down the block to the street where the UPS trucks were waiting for bag drop. Signage for each truck was at ground level so it was blocked by the people waiting in line and I had no idea which truck my bag needed to go in. I finally found the right one and then sprinted back to the bathroom lines, but they were ridiculous. I knew there was no way I was getting through the line before the race started and was immediately regretting all the water I had the night before and with breakfast. I took off running again down 12th street to find the other set of bathrooms. I made it to them 10 minutes before the race started but after 5 minutes in line I was still nowhere close so I made the decision to just wait until the first chance to stop along the course. The last RNR race I missed the start for because I was waiting in the bathroom line (they started the race early without making any announcement due to inclement weather on the way) I ended up getting diverted to the finish at mile 20 and having to give up on a BQ attempt. I took off running again – probably put in close to 1.5 miles before the race even started – and found my way to my corral just as the National Anthem was finishing up. On the plus side, I was really well warmed up. On the downside, my shoes were already soaked through and the rain would not stop for the next 13.1 miles. We took off on Constitution Ave and did an out and back over Memorial Bridge before turning up Rock Creek Parkway. My goal for the race was to run hard, but not stress over time, so I didn’t look at my watch the entire race (except to note how much time I lost making a pit stop for the bathroom just before mile 2 – about 80 seconds, err!). I actually managed to successfully do this and was pretty proud I never cheated and took a peak at the time. I felt strong at the start and kept telling myself not to go out too hard. I didn’t feel like I was overdoing it and the miles just seemed to tick by, which is always a great feeling. I continued along Rock Creek Parkway making my way towards the huge hill up to Calvert Street that spanned the end of mile 5 and beginning of mile 6. This hill is brutal and I wasn’t looking forward to it. There was not a ton of crowd support for this race, which I’m sure was down some cause of the rain and cold and it didn’t feel like there were as many bands as promised, but RNR certainly did this hill right. The Blue: Run to Remember crew was out strong with signs that had pictures of fallen military members and others holding American flags. It was really inspiring and definitely took your mind off the hill. I kept going through Adams Morgan with a few ups and downs, made my way past Howard University towards North Capitol Street and H Street. I don’t know this area of DC as well and don’t run here very often, so it was a nice change of scenery. My times definitely show that the hill hurt me for a little bit. I had brought a Gu with me, but didn’t feel like I could get it down, so decided to just push through with out it. Miles 11 through 12 I dealt with some side stitches that slowed me a little, but my legs still felt strong. Even though I could tell I had slowed down I was really pleased with how quickly the miles had passed. It felt like I got to 12 in no time and I never hit that stage where I was just praying for a mile marker to show up. I picked up the pace a bit again for the final mile and made my way past the DC armory to the finish. 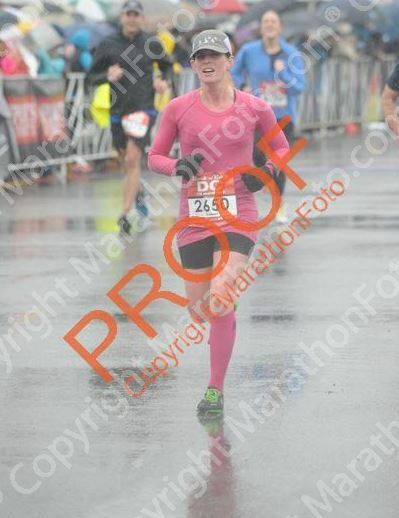 I was so pumped to have completed the race feeling strong after having battled through the rain. According to my watch I ran 13.31 for an 8:25 pace – a result of either being really bad at running tangents or veering off course for my bathroom stop – either way, I’ll take it! Officially I ran 1:51:58 for an 8:33 average pace coming in 2,322 out of 15,216 overall, 179 out of 1,924 in my age group and 803 out of 9,462 women! The finish line set up was beyond awful once you waked out of the finish chute. After collecting my medal, space blanket and snacks I had to walk all the way to the back of the lot to get my gear bag. We were about as far away from the metro as possible, which was pretty frustrating given how much they encouraged people to use the metro. I was almost convulsing I was shivering so hard as I made my way to the metro – I think that walk was seriously harder than any mile during my race. I finally feel like I’m making progress in getting back into PR shape and look forward to what the next couple months will be. The best part about this race for me was that despite the terrible conditions I caught myself breaking into a smile for no reason at certain points just because I was having fun out there! I was also so thankful for all the online support from my Oiselle teammates – several of whom were out there as well. A special shout-out to fellow bird Prianka who persevered through that rain for the full 26.2 and on top of that, set a PR! Amazing! How did your weekend races go? Next up for me is the B&A Trail half marathon in two weeks. I’m looking forward to what I expect will be a slightly easier course and what I hope will be better weather! 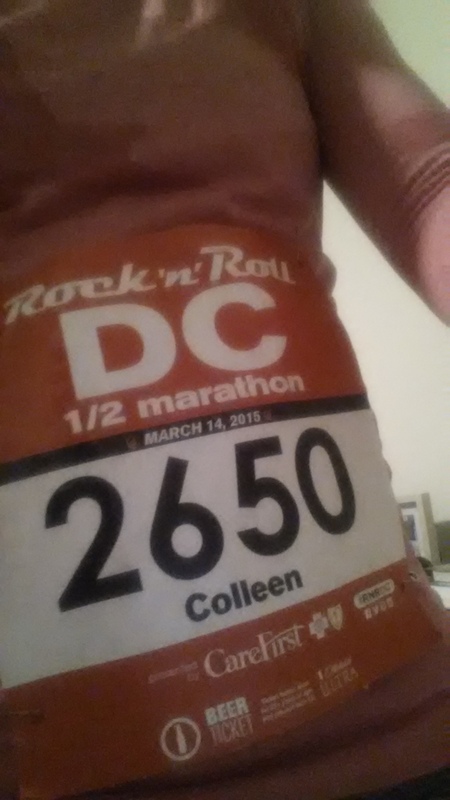 This entry was posted in D.C., Fitness, Races and tagged DC, half marathon, races, RNR, Rock n Roll, running by Colleen Lerro. Bookmark the permalink. Congrats on a great race! I have a love-hate relationship with RnR races. I’ve run the Philly half the past few years and it never seems like they deliver on the number of bands promise (even my dad who is my race Sherpa has commented on this). And the organization in the finish area is always a disaster. Good luck with the B&A half! Yea, you would think with the amount of races they put on they could figure it out, but oh well! such a tough race day in DC and no fun to have frustrations both before and after the race. but, it’s always good to feel progress! Absolutely – always good to have a silver lining! !